Years ago (once upon a time) my husband Andrew and a friend were puttering around a bookstore, when they came upon a "Where's Waldo?" book. 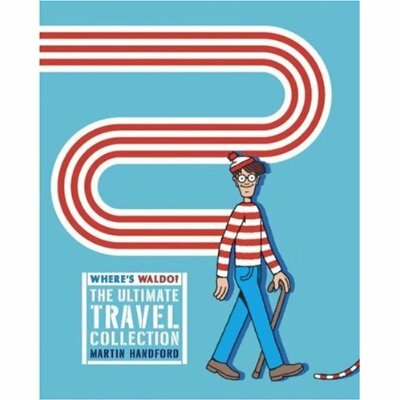 What happened next is the stuff of mythology, but suffice it to say that, as they flipped through the pages, Andrew apparently displayed a super human talent for finding Waldo: "There's Waldo! There's Waldo! There's Waldo!" From that day forth (based on that skill and Andrew's friend's talent for recognizing obscure voiceover actors), the guys developed a theory: everybody has a "Waldoism." And a Waldoism is defined as a idiot savant talent that is pretty much useless. Other Waldoisms include "Name That Tune" and, a gift my friend Vanessa possesses, "Name That Love Child," which includes spotting someone on the street and immediately being able to name the two celebrities who could have parented the poor fool. So, what is your Waldoism?? I want to hear good ones! I'm off to Miami and I want to deplane to discover a million amazing examples. Pretty please? My Waldoism is the ability to travel back in time and right wrongs, sometimes even with historical significance. Or maybe I’m thinking of “Quantum Leap”. Let me change that. My Waldoism is the ability to dig into an unusual wealth of 80’s TV knowledge and substitute episodes for my own experiences. My Waldoism is that I’m able to very thoroughly report on celebrity gossip past and present. It’s a sickness! Kevin can ID any voiceover actor or actress – now that is talent! My Waldoism is, I can spot if somebody has a psycho characteristic right away. It’s usually months later everyone else FINALLY see’s what i was talking about. Note: most psycho characteristics end up being forgiven because they stem from childhood insecurity and one shouldn’t be judge for things we can’t help.